Description: Architect Cassidy Logan has sworn off good-looking adventurers. Newly divorced, she’s focused on building ecologically friendly, historically accurate homes on the Chesapeake Bay for her father’s construction company. Traveling to Cannonball Island—where there has been no new construction in nearly one hundred years—Cass is sensitive to the heritage of the island, and has come up with plans so perfect she’s determined to buy a home for herself. Even the fact that Owen Parker—a local who she dismisses as a lightweight and a player—seems to be everywhere isn’t enough to deter her from building her dream house. My Impression: In the past I've had a bit of a complicated relationship with Mariah Stewart. Some of her books were fantastic but some were meh. However, I think it's time to be done with that as the last few books - including this one- have been firmly in the fantastic realm. The romance was good though there are some strong "thou dost protest too much" elements. Owen is definitely going to leave as soon as he finishes the job he's on. Just ask him, he'll tell you. Cass is quite convinced Owen is a player and anyway she has no interest in being in a relationship. Just ask her, she'll tell you. This can easily be overdone and fall into the irritating category but that wasn't the case here. It just explained why they were a little reluctant to jump into a relationship. I really liked both characters. Cass is intelligent and committed to doing the best job she can rebuilding and selling some of the houses on Cannonball Island. I liked that her motivations were really to do a good job and honor the history of the island and not just get ahead. Owen is a nice guy who is committed to his family - especially his great-grandmother which was lovely to see. He's self aware to realize that there may not be that much time left with her and is trying to figure out what to do about it. As well, he's able to really apologize when he needs too which is also a big plus in my book. This isn't strictly a romance. We see a lot of the community of Cannonball Island especially which I really loved. I loved seeing the history of the place and enjoyed the discussions on how to realistically preserve it so that the past residents won't be forgotten. Stewart has created a world that I really enjoyed visiting and am already longing to revisit. While some of the earlier books didn't wow me the last few have been wonderful and this is a series I'm really looking forward to continuing with! I love the changing of the seasons—and I think summer into fall might be a favorite, being as how I relate to the whole “autumn of my years” thing. That’s how I see myself, anyway. If sixty is the new forty, I believe seventy must be the new fifty, eighty the new sixty, and so on. Therefore, I fall into that third quadrant. Don’t try to change my mind or confuse me with facts. One of the reasons I love this time of the year: the steady influx of tourists into St. Dennis begins to wane. Not that I don’t love our visitors. Why, without them, St. Dennis would have continued to languish and would never have become the Eastern Shore mecca it now is. But there’s something sweet about having your hometown belong to you and yours again, even if it’s just for a while. I know soon enough the holidays will be upon us and many will flock to town for all the beautiful festivities—the Christmas House Tour, the weekend of caroling, the tree lighting at the square on Old St. Mary’s Church Road, Christmas at the Inn (a favorite of mine), and, oh, yes, the shopping! But this little respite between the beginning of September, when the families leave to return their offspring to school, and the holiday madness belongs to us, we old St. Dennis folk who like a little downtime. Not to say there’s nothing going on here! There are new babies to celebrate and a special wedding on the horizon, one that makes me especially weepy. My dear nephew, Alec, will be marrying his lovely Lisbeth in an event that will be the talk of both St. Dennis and Cannonball Island for a long time to come. I’m not privy to all the details, mind you, but since my daughter, Lucy, is planning the wedding, I’ve heard bits and squeaks of what she has in mind, and it will, no doubt, be perfectly wonderful. When we were children, Mama told us that when good folks passed, they earned a star in the heavens where they could sit and shine down on all the goings-on here on earth. Our brothers scoffed, but we girls believed her, and so it is that I know my beloved sister, Carole, will be watching happily from her star as her son marries his bride out on the point in just a few more weeks. Thinking about the point makes me think of all the changes that are coming to Cannonball Island soon. So much, it could make your head spin! For the first time in roughly two hundred years, new dwellings will be going up on what had once been barren land. I heard from one in the know that some of the older homesteads—mostly those that have fallen into ruin or have been abandoned—will be replaced with new versions more suitable to modern living. Some are up in arms about this, but frankly, it’s about time. Those dilapidated old shells offer no shelter and, if anything, detract from the beauty of the island. My good friend Ruby Carter—the island’s matriarch—has given her blessing, and that’s good enough for me. Besides, Alec will be serving as the environmental consultant, so I feel confident that all will be well. The new homes are being designed with the island’s history in mind, so the legacy of those early settlers will be well protected. The architect is a lovely young woman who is serious about this project, so I know, eventually, all will be well. before too long. It will be amusing, to say the least, to see him meet his match. Will he be bested? The smart money’s on the new girl. That’s all I have to say about that. And so much excitement over all the goings-on at the mouth of the river on the other side of Cannonball Island! Who knew such mysteries lay beneath the water, waiting to be discovered—and now that they have been, well, the flurry of activity these days has my poor old head spinning like an old-fashioned top. I cannot wait to see what they find, and I’m more than happy that one of the principal players is staying at the inn. Not that I’d pry, but if one overhears a snippet of conversation now and then . . . well, let’s just say it’s good to keep informed. Now, how all this is going to affect the construction that was slated to begin in November, well, I suppose everyone will have to wait and see. Could be there will be delays, which will keep the new girl around for a while longer and will keep the rolling stone on his toes. Is this the kind of series where you can jump in anywhere Katherine? Seriously, this book looks so much your alley! I don't think I've ever read a Mariah Stewart book. Although maybe I did years and years ago. But I'm so glad you enjoyed this. 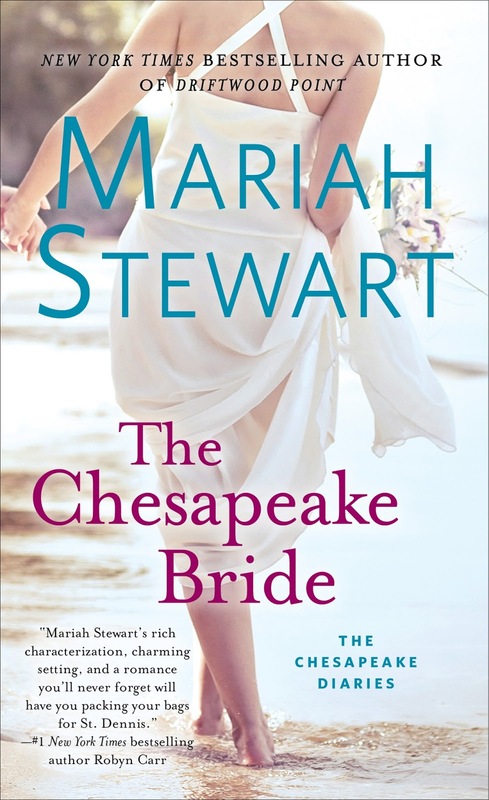 I'll admit, I totally thought the title was 'The Cheapskate Bride' xD I'm not normally drawn to romance novels, but this one sounds fun! I read the first three in the series but didn't get invested enough to keep reading. Perhaps I need to take another look. Being a little more than a romance doesn't bother me as I like a plus! I have been really curious about this one. I haven't read Mariah Stewart before but this one is calling to me. Maybe someday. I liked it even though I've only read a couple in the series. Easy to jump in and out of. This sounds like something I would like. Your mention of it going into the history of the place, in addition to everything else. I will have to add this to my wish list. Thanks for your great review, Katherine. This one sounds really good. 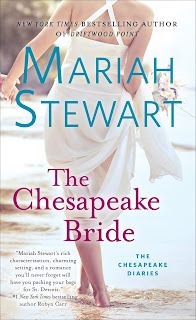 I've enjoyed Sherryl Woods's series set on the Chesapeake Bay. For years I've been meaning to try Mariah Stewart's series. It sounds like this one can be read out of order, so perhaps I'll give it a try.